Any experienced landlord will tell you that being a landlord does not always result in a guaranteed profit. For reasons outside of your control, tenants may end up owing you rent, breaking their lease early, or leaving expensive damages. In many cases, one or two month’s rent as a security deposit is not enough to cover those costs, resulting in losses. Most landlords accept this as part of the risk of being a landlord, but getting LeaseGuarantee can eliminate that risk. What is LeaseGuarantee and how does it work? LeaseGuarantee provides annual coverage ranging from $2,500 to $10,000 for lost rent, damages, or legal fees. Order an AAOA Red, White, Blue, or Gold tenant screening report on a potential tenant. If the tenant qualifies for LeaseGuarantee, you can click on the tenant’s report to purchase or invite your tenant to purchase LeaseGuarantee. Be sure to get LeaseGuarantee within 10 days of placing your tenant screening order. In the event of property damage or eviction, filing a claim is simple. Provide the court judgment and a copy of the lease agreement and rental application. There are no deductibles. The judgment will be reimbursed up to your coverage amount. How much does LeaseGuarantee cost? 80% of court judgments are never collected by the landlord: Even if you take a tenant to court and you get a monetary judgment in your favor, the tenant will most likely not have the assets to pay for it. You may seek the help of a collection agency, but that means additional cost for you and still no guarantee that the collection agency can recover the money that is owed to you. With LeaseGuarantee, you don’t need to hunt down the tenant for the judgment, LeaseGuarantee will pay out the full judgment amount up to the coverage you selected within 30 days, guaranteed. That means no losses and no stress! 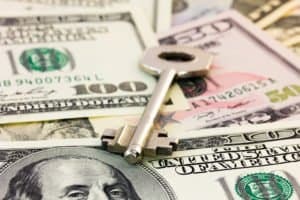 Damages may exceed a traditional security deposit: How many times have your tenants tried to use their security deposit as last month’s rent? You may specifically have a clause in the lease stating that they cannot do this, yet it is a common tactic tenants use to avoid paying for damages they leave behind. Also, a security deposit might not be enough to cover damages, which means you end up paying out of pocket for repairs. LeaseGuarantee would cover those costs, so you don’t have to rely on just a security deposit. Unexpected changes in tenant employment can result in lost rent: Even good people that meet your rental qualifications could have changes in their employment during your lease term, resulting in a broken lease or owed rent. LeaseGuarantee may help cover your losses and costs of filling a vacancy if this were to happen. Evictions cost on average $3,000 to $4,000: Evictions can be a nightmare experience for landlords, especially when the evicted tenant overstays their welcome and draws out the process for months. Not only does the tenant usually owe rent money, you cannot rent out the unit until they leave. You may never fully recover the money that is owed to you unless you have LeaseGuarantee. LeaseGuarantee would cover the legal, court, and judgment awarded to you, so you can cover your costs quickly, with little to no stress. Trying to fill a vacancy can be harder than you expect: Depending on the rental market you are in, you may have a vacant unit for months between tenants. Traditionally, landlords have to wait to find a tenant that meets their qualifications, even if that means losing money on the vacancy. With LeaseGuarantee you can fill vacancies faster without increasing your risk. If someone with subpar credit history or evictions applies to rent, you can require LeaseGuarantee as a condition for move-in. You’ll have almost no risk, you’ll fill the vacancy, and they’ll be thrilled to be approved for your rental.